← Ortino’s Northside Hosts “Books in Bars” Happy Hour! Oermead Press is thrilled to be publishing the anthology West Chester Story Slam Selected Stories – 2010-2014 this November. The anthology will feature forty stories told during the first five seasons of the West Chester Storytelling event. The anthology is scheduled to be released on Tuesday, November 11th, the same day as the West Chester Story Slam’s 5th Annual Grand Slam, which is the culmination of another sold out season. Stories included in the anthology include: Ad Man Eli Silberman’s “Release the Condor” Story, Terry Heyman’s classic “Ordinary People” story of her brief fling with Timothy Hutton, Luanne Sims’ “Adult Diaper Changes” story, and Michael Gleason’s “Bad News Bears” story. The forty stories were chosen by West Chester Story Slam Founder Jim Breslin and edited to retain the feeling of the original live presentation. 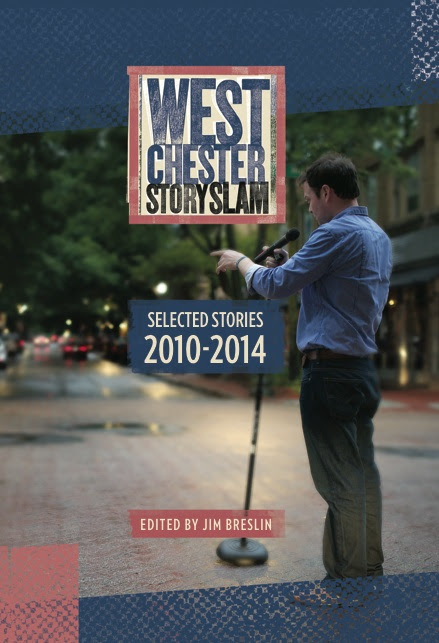 West Chester Story Slam Selected Stories 2010-2014 will be available at the Grand Slam on November 11th at the Chester County Historical Society, and will also be available at Chester County Book Company, Oxford’s BookPlace, IndieBound, and Amazon. If your store is interested in selling copies, contact us at oermeadpress@aol.com.